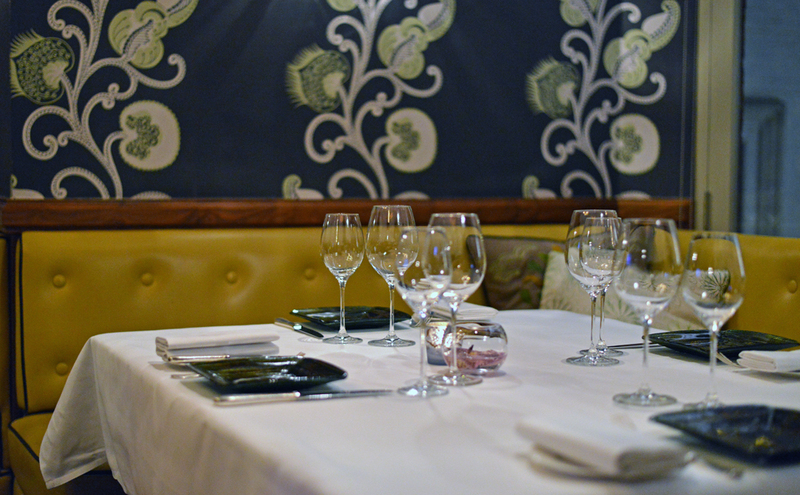 7 Park Place – William Drabbles Tasting menu 2013. It was a return trip to William Drabble at 7 Park place and the first stop on another London foodie weekender. We chose Chefs Tasting menu again as it had totally hit the mark on our first visit ( see here ). I`ve known Chef William for a number of years now, he`s a great guy and as i explained in my first post on 7 park place, he comes from the stables of my legendary Chef hero, the great man himself ” Nico Ladenis” ..enough said. So at this point I`m going to explain about my dramatic dive into the gutter with the foodie photos below. I`ve already done comparisons with my 2 cameras on previous posts ( Lenclume pics ) and normally wherever i go my little pocket sized Panasonic Lumix LX7 is glued to my eyes. In a drawer at home i also have a state of the art Nikon D800 ( better known as “the Bazooka ” ) and 3 very good lenses.These all sit there totally lonely and just gather dust….basically because i dont know how to use them and also because i prefer the quality of my £300 lumix for all of my food photography. The photos below of the food at 7 park place demonstrate perfectly that i can`t use my £3000 camera at all. …Cue the pro. The whole idea behind this London trip was for me to come down and have a day`s tuition with London based food photographer `Paul Winch Furness` and spend a day being taught how to use my Nikon D800 before i finally gave up and sent it off to Ebay. Paul acually teaches small groups of photographers how to take photos of food and it`s only £120 for a full day including a feast for lunch. You `ll see the results in my next post. So here`s my meal at William Drabble and my terrible results using the Nikon in program mode using a 50mm standard lens. Apologies to Chef William. I can only blame the camera as always and not the photographer…..Oh and David from The Critical Couple who also dared me to have my Lumix surgically removed from my eye , and leave it at home….. it was like having my arm cut off. Note – My next blog post will be the photos from my full day with Paul photographing the food and interior at restaurant `Roti Chai ` and my first effort at SLR photography in Manual Mode……Awesome , just wait and see the difference a little bit of tuition can make….and so on with the meal. There wasn`t any form of Canapes or Amuse served before the Tasting menu began which came as quite a surprise.I would have expected a little something as it`s pretty much industry standard wherever you go these days. There was no `pre dessert` served ,another surprise on a tasting menu. Anyway , it was straight into the meal with a Bang and the Seared Foie gras with Roasted Quince and Hazelnut dressing. It always hits my sweet spot , i adore Foie gras in any shape or form. Marinated hand dived Scallop with Dorset Crab and Blood Orange Mayonnaise. Only a small taster for two decent sized guys but what was there was good. Ravioli of Langoustine with Savoy Cabbage and Foie gras cream sauce…Beautiful old school , i could have eaten a dozen of these no problem. Griddled fillet of Sea Bass with Creamed Leeks , Mushrooms and Red Wine. Selection of Cheese from Paxton and Whitfield. Caramelized Banana with Banana parfait and Caramelised Milk – Bit of a let down on this course for me i`m afraid to say.I actually thought that this was the pre-dessert.Not a lot of effort , no showmanship from the pastry section and it really shouldnt have been a showcase dessert on a tasting menu. Petits fours – A perfect little selection of sweet treats. Marshmallows – As many as we could eat. All in all a decent meal for £69. Some nice classics and `old school` cooking methods which i dearly love…Lamb , Foie gras , Scallops, Sea bass , Black Truffle , Langoustines , Cream and Butter = Satisfied. Previous Post Glasgows Ubiquitous Chip restaurant. Next Post Roti Chai – Indian Street food in London.